Aromatherapy uses potent concentrations of essential oils from plants to balance and heal the body in a variety of ways. 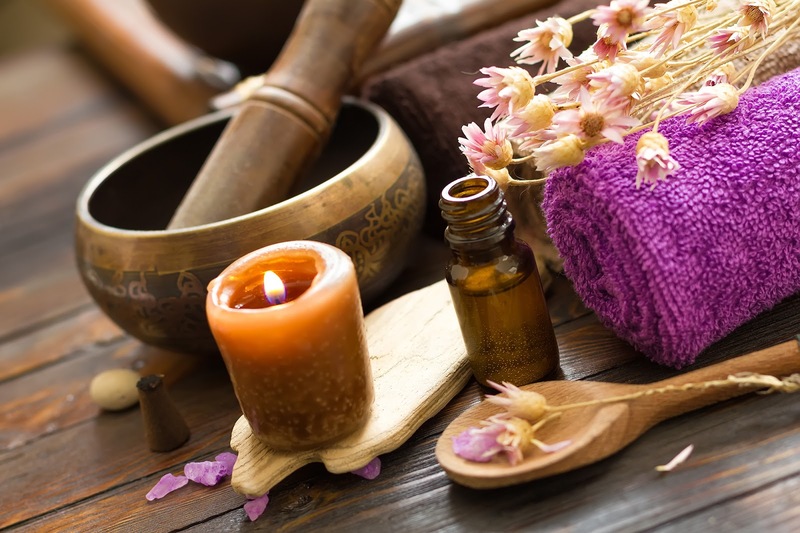 Certain essential oils are used for healing and relaxing, boosting immunity, fighting infection, decreasing stress and anxiety or for their anti-fungal and antiviral properties. All essential oils have disease-fighting antiseptic qualities. Among the profuse number of plants rich in essential oils are anise, balm melissa, basil, chamomile, cinnamon, cardamom, cypress, fennel, eucalyptus, feverfew, juniper, lavender, marigold, marjoram, mandarin, peppermint, pine, rosemary, rose, sage, thyme, valerian and yarrow. Helps to cleanse the body of toxins and wastes. Calms and relaxes the body and mind. Decreases high blood pressure and soothes headaches and pains. Specific essential oils contain properties that treat certain ailments or enhance certain emotions, mental states or disease-fighting abilities of the immune system. Rosemary and mint aromas enhance memory and concentration. Scents of lavender, jasmine, chamomile, marjoram and geranium are calming and help relieve insomnia to beat fatigue and stress. Eucalyptus oil clears respiratory passages in individuals suffering from asthma, colds or allergies. It is also a strong antiseptic that will banish bed bugs when added to laundry water and remove infectious particles in the air when used in an oil diffuser or candle. Relax and reduce stress and insomnia with two parts lavender oil, two parts marjoram and one part mandarin oil. Decrease anxiety with three parts lavender and one part sage oil. Cleanse the lymph system and boost the immune system with 3 parts cypress oil, two parts grapefruit oil, one part juniper and one part lavender oil. This combination helps release toxins and excess fluid from the body. It is better to avoid inhaling directly as this may irritate the mucous linings of the nasal passages and throat. Use essential oils sparingly; a little goes a long way. Essential oils can be expensive because often a large amount of plant material is needed to squeeze out a few ounces of oil. For example; roses yield a mere one pound of fragrant essential oil from every two thousand pounds of rose petals! However, remember that only a few drops are used at a time. Essential oils are usually sold combined with carrier oils such as almond, soyabean or wheatgerm oils. This acts as a base and keeps the essential oils stable and longer lasting. Store essential oils in a cool, dry place and keep tightly closed. If you have allergies, perform a skin patch test by putting a tiny drop on the inside of your wrist. This will determine any possible adverse reaction. Consult your physician before trying aromatherapy if you have an existing medical condition. Essential oils should be used in very small amounts for the elderly and for children.